Motorcycle gamers are going to rise up. The Trials series of video games are physics based motorcycle stunt/racing games. 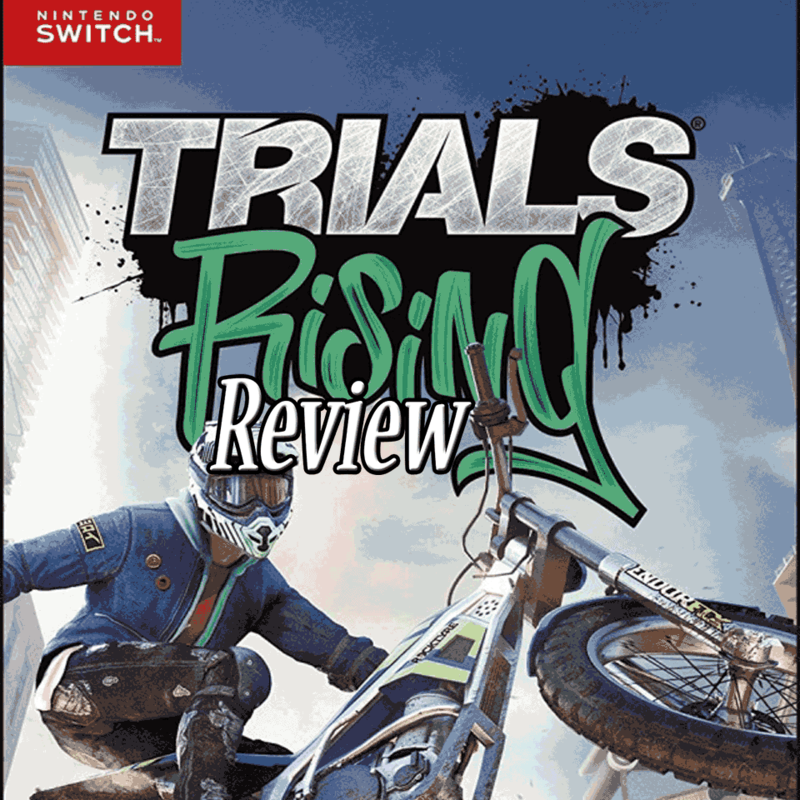 Trials Rising is the fourth mainline game in the main series, (not including the original browser games). It was developed by Red Lynx and published by Ubisoft Kiev. It also came after 5 years since the last entry, so it is easy to say that it is “long-awaited”. In these games, you ride a motorcycle across some larger-than life racing tracks. The challenge is in making sure you balance your bike properly, along with the throttle, and some complex maneuvers to manage some of the tricks. It features not only a slew of mind bending tracks, but a very robust track editing system. One that allowing users to make complex tracks of their own to be played and shared. This keeps the content flowing even when you’ve finished all the tracks that came with the game. Or, likely before that, because the level of difficulty can get insane later on. This review is for the Nintendo Switch version of the game. Its portability will factor into the rating. So this game has a moderate downgrade for being on the Nintendo Switch. To date however, I’ve yet to play it in docked mode. That’s right, I’ve been playing this game on the go at all times. And the graphics look pretty decent on that small screen. Which is not saying much, but there are some levels in the game where they really go overboard with the visuals and they look great. At the same time, there are always a few assets that look low-res or jaggy. The rider doesn’t look that great either. Still, its nice to see them take location into consideration. Every stage of the races are based on where on Earth they take place, taking you across many different cities and continents. So, main takeaway is that the graphics are not technically brilliant on the Switch, but some stylistic choices in some levels look fantastic. Let the record show that this is the first time the story section of our reviews have been renamed to include immersion. I’m sick of having to explain what games win in this category if they don’t have any plot. The “plot” of this game, so to speak, is actually more cohesive than older titles, as it actually contextualizes what you are doing. You are competing in the Trials worldwide championship. This amplifies the asynchonous multi-player aspect of the game, where you get ranked against other players worldwide. This is also the first game to have an in-depth tutorial that you can revisit to learn how to do some of the more difficult maneuvers. Unfortunately, the progress of the game, although smooth at first, eventually grinds to a screeching halt. You see, you play several trials, and you can get a bronze, silver, or gold medal for your final time. Each track also has a “contract” for you to fulfill. This is basically a challenge like “do 6 backflips” or “finish with less than 5 faults”. It’s daunting at first until you realize you can do them separately. Still, the supercross championships really get tiresome. In order to unlock more tracks, you either have to complete these, or go back to old tracks and grind out experience to unlock gated content. The game stops dead once you have to partake in a championship where you have to win 3 consecutive times. Not cool, needs to be patched out. This is Trials, having a perfect run 3 times straight is a big ask, and it isn’t fun. Still, it’s always hilarious to see your driver die horrendously at the end of very track. The delight I had once I heard the soundtrack was jaw-dropping. For the first time ever, Trials has a licensed OST! Now, don’t knock licensed music in a game, sometimes a great playlist can really help a game in place of original music. This game chooses to hit you with some old school music, the kind that gives me Crazy Taxi vibes. Old school punk, old school hip hop, old school metal, and just a touch of EDM from the early New Zeroes. It is guaranteed to please a lot of older-aged millenials. Have a listen if you don’t believe me. No reason to talk about the rest of the audio. There is no voice acting, the bike sounds like a bike, the props sound like props. The one major change from this game and the last one is actually the removal of a feature. In Trials Fusion, you could perform a trick by moving the right thumbstick while in the air. Its not in this game, but it is kind of unnecessary. The challenge is big enough and the contracts keep everything exciting. Other than that, this is a game that can be very addicting, and very fun. That is, if you are okay with the kind of gameplay where you might have to replay a level many times to get a better time. Or, eventually you will find yourself on attempt 86 of one particular jump. Simplicity is the look of the game, but you will be surprised as to how in-depth the controls can get later on. That’s all there is to it. You don’t have to be a fan of racing games or motorcycle games to enjoy this title. It’s about overcoming unique challenges, not so much the racing, even though that is present. I first played this game while on a Bus ride from Providence to New York city, roughly a 4 hour nonstop trip. After reading for a bit, I eventually broke out the Switch and started playing. The next thing I noticed was when the bus got to NYC and started to slow down. I was absolutely enraptured by the game. The surprise soundtrack, the layout of the game, the excitement of playing a Trials game on a portable console. They all just came together perfectly and I had a great time. The only problem I had is that there are loot boxes to unlock custom appearance, but they are sadly abysmal. However, you can easily ignore them. When you finally do get stuck on a level, you can just as easily jump onto the user content section. Then you can play some amazing tracks there instead. This is the kind of game the Switch needs. By and large, Trials Rising is already a great entry in the series. Having handheld access to play it on long bus rides or simply waiting in general can really enhance your day. You can pick this title up for any console you want, obviously. Just note, if you wanna save some money, the physical copies cost way more than the digital ones. Gold Edition copies that feature the season pass are the only hard copies of the game, usually for $40. Or you can just spend $25 digitally on the base game and then get the season pass later if you really like it. Which I definitely recommend if you’re new to this series.